Height between floors.actual finished floor height on the lower ground floor to the top floor finish. Width of stairs.Width of a flight of stairs including railing, stringers, etc. Increment.Actual width of each flight of stairs railing and stringer discounting. Stairwell.Space the ladder unfolds. is determined by the upper recess. Riser.Height difference between two consecutive steps. Front.Vertical part of the rings which normally coincides with the height riser. 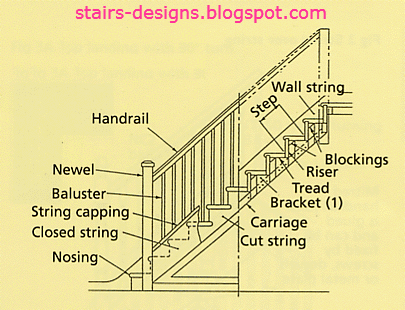 Step offset, range, triangle, etc.shaped rungs that appear in turns of stairs, resulting from the partition of a landing in several steps to improve the height of the risers. Open staircase / ladder closed.opened without risers, there gap between steps. Closed risers. stair compensated.One in which the steps have been offset in the rotation to facilitate the transition. Spiral staircase with central axis.Staircase with circular imprint line built around a shaft or mast. They may be in round or square boxes ladder. The steps are the same shortening, are equal and end at a final landing. Rung at ground level.Final step at the same level of the upper floor. Step out.Bottom rung of the ladder. You can go a height below or level with the top soil. Often used a final landing. Step boot.First rung of a ladder that can be shaped for easy access. Eye of the ladder.Free between the legs of a U-shaped staircase . Line trace.imaginary line that is a ladder which most of the time in transit. In the straight sections are usually located in the center but is especially relevant in turns to deliver distances from the ends. Footprint.Horizontal portion of the step on which the foot rests. Light tread. Giro.Changing direction. A ladder can rotate clockwise in a clockwise or counterclockwise instead counterclockwise. Outside staircase.Located outside the building. Arrival or landing of the staircase.Near the top floor where we want to reach the stairs. Pylon, or newel post.Banister stanchion. In turn, also used as a structural element and turn the wooden stairs. Rounding steps.Attempt of the edges with a small radius cutter. Flight of stairs.Sequence of consecutive steps to the emergence of a turn. Flight of the step.Part of the tread that protrudes from the riser for the front. Amplitude of the front edge of the steps to allow more tread on the rise. The flight has to be small to prevent users stumble. Forge.Concrete structure, wood or iron on the top floor that bounds the stairwell. It is important to know your height to avoid the bad situation . Bridle.Said of the existing clearance between a stepping stone and wrought / roof top. Assumes a disability because you can give to the head or psychic because it seems like you're going to hit. The minimum required to avoid the snooze is 200 cm. Slope of a ladder.Is the ladder inclination to the horizontal plane. Railing.Protection of the stairs in his free hand. There are different options, the most common is mullion assemblies between hearth and balusters and handrails. Thickness step.stringer, riser, etc.. Thickness . Step.step ladder part that serves to support the foot on the tread. Footprint and include flight, the latter option. Footprint.Horizontal part of the step on which the foot rests. Rails.Security element for the user of the ladder rests. We found part of the railing as superior piece provides stability and collects loose balusters or subject with brackets to the wall.